These are Lorna Fencer's main painting stories - together with examples of paintings expressing each story. For more information, go to Lorna's artworks page, to find individual works we have on sale, or read her biography. 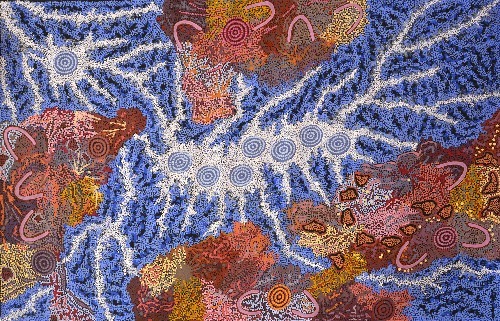 Lorna is one of the great names of Australian Aboriginal Art, not only for her forthright and creative style, but for the person she was, and the way she translated these traditional stories into great works of art. Her works represented an artistic transformation of traditional Indigenous Jukurrpa (important stories) and inspired generations of Aboriginal Artists who have come after her. Most of all, don't miss our online and in-Gallery exhibition of Lorna's works which opens on 2 March 2013 and continues until 21 March. All exhibiting artworks and their details will be on line from 1 March. 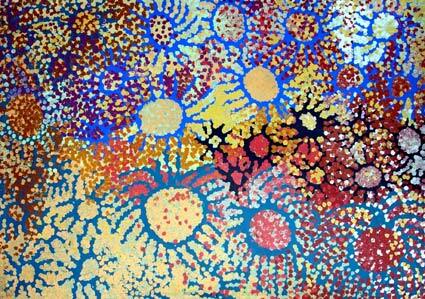 "At the heart of Yulyurlu Napurrula's Warlpiri identity are the Jukurrpa that she owned and painted. As an inheritance from her father, Kuurrpa Jakamarra, she had proprietary rights as kirda for three closely interconnected Yam or Yam related Dreamings. The first is Yarla (Sweet Potato or Large Yam), Ipomoea costata, also known as Puurda and Yalijirrpa. Of equal importance is Ngarlajiya (Pencil Yam, Small Yam or Bush Carrot), Vigna lanceolata, also known as Wapurtarli, Wapirti or Wajaraki. Finally there is the Yarla-Pama (Caterpillar or Yam Grub), sometimes referred to by the generic Walpiri name laju. Yarla-Pama is sometimes rather misleadingly called Caterpillar Dreaming, suggesting that it is an entirely separate Dreaming from the two aforementioned Yam Dreamings, but it is not. These three elements – Big Yam, Small Yam, and the Caterpillar – are part of the same localized ecosystem in and around Yumurrpa and Wapurtarli. As such, they co-exist within the same Dreaming narrative, and each part may be described as Yam or Bush Potato Dreaming. Sometimes artists, including Yuyurlu Lorna Napurrula, differentiate between the subjects, which is a matter of personal choice, and paint the many individual episodes comprising the broader Yam Dreaming narrative. The Yam Dreaming, in all of its differing iterations, constituted the greater part of Lorna Napurrula Fencer's life work as an artist. She returned tima and time again to this principal artistic theme, for which she became celebrated and for which she is, and will be, remembered. This subject can be regarded as her muse, providing her with a rich source of inspiration throughout her life, whether that be through her body paintings, her structured earlier works, or her later gloriously messy, chaotic, often colourful gestural artworks. It was her deep and thorough knowledge of this subject matter that allowed Napurrula to be so adventurous in creating her artworks. In some works she would cram in as many aspects of the Dreaming as possible, while in others she chose to hone in on a particular detail. Because of the importance of yams as a staple Warlpiri foodstuff, and for feeding large numbers of people during large scale initiation ceremonies, an important aspect of the Yam Dreaming narratives relates to mapping the yam's growth and distribution patterns throughout the Warlpiri desert regions." This Jukurrpa or Dreaming Creation story belonged to Lorna's father, and its custodians are the Jakamarra and Jupurulla skin groups. Lorna says of the subject- "It's a big story that Yarla, Bush Potato. It's main tucker in my country." The ceremonies associated with this site re-enact the myths of the Ancestors who pulled out the first Yarla (bush potato) from the earth around the underground water source at Yurmurrpa. The Yarla, Bush Potato or Bush Yam paintings, relate the Jukurrpa Dreaming story of the women of the Napurrula and Nakamarra skin groups. These women travel with their digging sticks and coolamon dishes. The coolamons are used for collecting bush tucker, especially bush yams. The yams grow on underground roots, so the women need the digging sticks to break up the ground, and follow the root system to find the yam tubers. Fully grown yams can be very large, half a metre or longer in length. The lines represent the complex root system and branches of the bush potato plant. 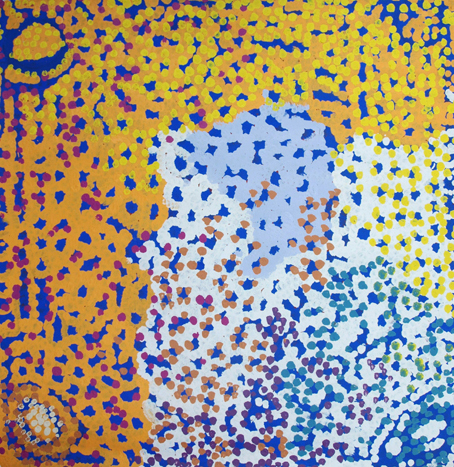 This Dreaming is associated with the site at Yurmurrpa, near the Tanami Road north of Yuendumu. This painting represents the sequence in the Yam Dreaming story where two groups of Ancestor Beings came into conflict. 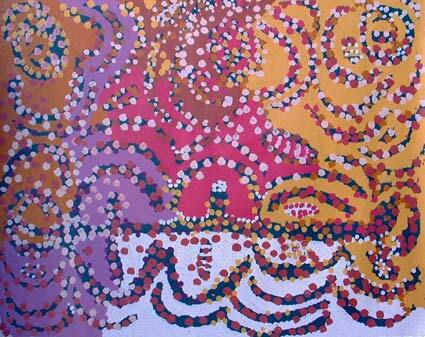 Lorna Napurrula described it in this way: "Two ancestor mobs were fighting about Law Business in the Dreamtime. They came from Wapurltarli and Yurmurrpa and were digging for yams. There was a big fight because both mobs have the same Dreaming story – they dance with the same Dreaming story. Wapurltarli has the small pencil yam, Wapirti, as their Dreaming, Yumurrpa has the big yam, Yarla. There was a big fight in the Dreaming over ownership of the different Yam Dreamings. All the curved lines are the people, a big mob." "In terms of understanding the Yam Dreaming narratives, it is important to recognize that all the Dreamings are simultaneously understood to have the capacity to assume human form as well as having a physical iteration as part of the natural world. Thus the Yams are conceptualized as both man and yams." In the Yam Dreaming story the ancestors of the Little Wapirti Yam, fought in a great battle with the ancestors of the Big Yarla Yam at the Yumurrpa site, for which the artist was a custodian. "One of the most significant aspects of this intertwined narrative…was the relationship of this multi-sided Dreaming to the deepest tenets of Walpiri social organization regarding the 'proper' distribution of limited food resources. Walpiri people view yams highly as a staple part of their diet. Of equal importance, these Yam Dreaming narratives enshrine the principle of a small society's need to regulate cycles of violence and revenge, chiefly for the purposes of group survival. The extended narrative makes it very clear that in no circumstances can uncurbed violence be socially sanctioned." "Bearing these factors in mind, the Yam Dreamings principally concern two Jakamarra brothers, Yumurrpa (the older, Big Yam) and Wapurtarli (the younger, Small Yam, in and around the major Yam Dreaming sites. Over a long period the two groups associated with the brothers engaged in a series of battles to the death, and in the course of these many followers on both sides were slaughtered. Eventually the Big Yam brother from Yumurrpa prevailed over the Small Yam people. Today the bodies of the fallen can be seen as one draws near the Yumurrpa site, in the form of many largish, variably shaped, bright white rocks strewn all over the ground. Caterpillar Dreaming (Jajurtuma Jukurrpa) is a significant song cycle and ceremonial narrative that belongs to the Jakamarra and Jupurrula skin groups. 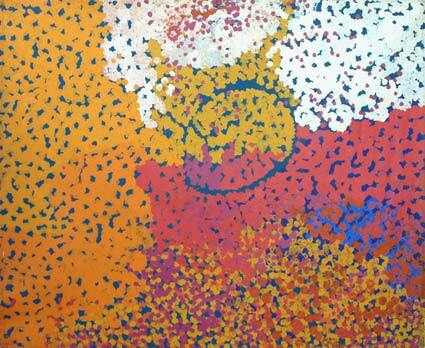 This means that Lorna's father and brother were custodians for this Jukurrpa. The ceremony also involves women from the Napurrula, Napanangka, and Nakamarra skin groups. Lorna describes the subject in this way - "These are caterpillars, in a big tree, cheeky ones, in my country, Yapa country, in the Tanami Desert." These little green caterpillars cluster together in groups of hundreds. They live in and eat the leaves of the trees. The slightest touch causes an itchy red rash on the skin, which will cover the whole body with hives. The circles represent the trees where the caterpillars build their colonies. Often a squiggly line represents the caterpillars, when they have completed their growing cycle. 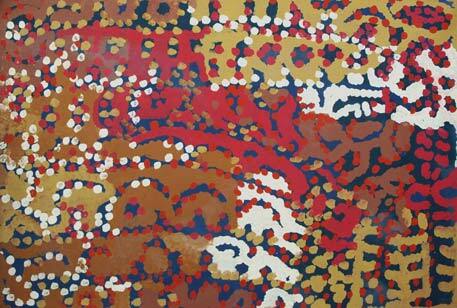 The story for this Jukurrpa comes from the artist's ancestral country at Yurmurrpa in the Tanami Desert. Murkarki, or Bush Plum is one of the bush foods that grow close to the Yam Dreaming site which represents the main theme of Lorna Napurrula's paintings. The bush food Murkarki, or Bush Plum, is collected at certain times of the year. It is found widely throughout the region, though it has declined in abundance due to the grazing of cattle and rabbits. The bush plum fruits in the summer after the first rains and is an important food source, even though not all of the plum is edible. When young, the fruit is green in appearance but as it matures, it becomes a purple-black colour. It is similar in looks to an olive. The plant can grow up to three metres high and has blue-green leaves and produces a creamy white flower, making it an attractive looking plant. The story of the Water Snake is associated with Jarrada, the story of run-away lovers. An old man and his girlfriend, they decided to run away. They set out in different direction to all the other people, moving away from their family clan. They are the right skin, but they didn't want to stay in one country, they chose to move on. The Water Snake associated with their story, it's a desert snake, like a desert python. It represents Jarrada, the Runaways - lover girl and lover boy. Jarrarda is a Warlpiri word referring to the behaviour of lovers, both male and female, especially when they are runaways. Mirtimirti means lovers, in love, 'boyfriend' and 'girlfriend', whether in a relationship that is sanctioned by Warlpiri Law, or one that is considered to be transgressive. Pirntina is the Warlpiri name for the Woma Python (Aspitides ramsayi). The pirntina is a thick bodied desert snake with a small head that is virtually indistinguishable from its neck. This opportunistic snake lives in the burrows of others, including goannas' burrows. It is for this behavioural reason, as well as its obvious phallic associations, that this snake is regarded as a metaphor for men who take other people's wives as their lovers. The pirntina is closely associated with the Mirtimirti, or 'Lover Boy', an old man who decides to run off with his girlfriend to different country, in Lorna Napurrurla's painting of the same name. Mirtmirti, Lover Boy, relates to two runaways, with a focus on the male party. Sometimes such lovers can be in a wrong-skin (i.e. illicit, or incestuous) relationship. In the case of Lorna's work these people are in a technically 'correct' or 'right skin' relationship. The association is however still somewhat problematic and transgressive because the male has a prior-existing relationship, which is not being honoured in this instance. 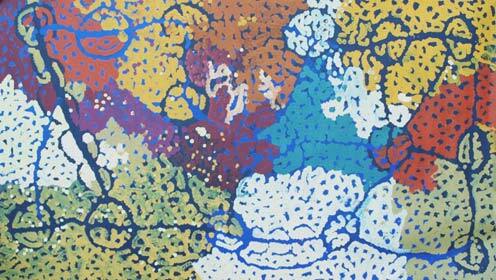 This work is associated with a Warlpiri visual art genre known as Yilpinji or Love Magic paintings. Wapirti is the small white bush potato, one of the types of bush yam that Walpiri people collect as a staple part of their diet. Lorna says "When you see the leaves, above the ground, that's how you pull them up, by the leaves." Wapirti is also a central part of the Yam Dreaming story that belongs to the artist, and links to the other major subjects that feature in her paintings. In the Yam Dreaming story, "the Wapirti spreads out from Ngarnka, or Mt Leichhardt, moving towards Wapurtarli, and eventually arriving at Yumurrpa, or Cave Hole Well, the country where the major Yam drama unfolded. In terms of understanding the Yam Dreaming narratives, it is important to recognise that all the Dreamings are simultaneously understood to have the capacity to assume human form as well as having a physical iteration as part of the natural world. Thus the Yams are conceptualised as both man and yams." In the Yam Dreaming story the ancestors of the Little Wapirti Yam fought in a great battle with the ancestors of the Big Yarla Yam at the Yumurrpa site, for which the artist was a custodian. 'Lorna says of the Janmarra, bush onion, "This is a little one, a white one. You find them near a creek, or on the side of a riverbank. They are like an onion. In soft sand, you dig them up. A big lot together." The bush onion, a small bulb, grows in salty ground and can be dug up in large numbers in a good season. The gatherers break up the ground where they see dry Janmarra grass growing, and sit for hours brushing aside the soil with their hands to locate the bulbs. These need only the lightest roasting - it is enough to rake them round for a few moments in the embers of a fire. They have a mild flavor, their crunchy texture being their chief appeal. This painting represents the sequence in the Yam Dreaming story where two groups of Ancestor Beings came into conflict. Lorna Napurrula described it in this way: "Two ancestor mobs were fighting about Law Business in the Dreamtime. They came from Wapurltarli and Yurmurrpa and were digging for yams. There was a big fight because both mobs have the same Dreaming story – they dance with the same Dreaming story. Wapurltarlihas the small pencil yam, Wapirti, as their Dreaming, Yumurrpa has the big yam, Yarla. There was a big fight in the Dreaming over ownership of the different Yam Dreamings. All the curved lines are the people, a big mob." "One of the most significant aspects of this intertwined narrative… was the relationship of this multi-sided Dreaming to the deepest tenets of Walpiri social organization regarding the 'proper' distribution of limited food resources. Walpiri people view yams highly as a staple part of their diet. Of equal importance, these Yam Dreaming narratives enshrine the principle of a small society's need to regulate cycles of violence and revenge, chiefly for the purposes of group survival. The extended narrative makes it very clear that in no circumstances can uncurbed violence be socially sanctioned." Today the bodies of the fallen can be seen as one draws near the Yumurrpa site, in the form of many largish, variably shaped, bright white rocks strewn all over the ground."